Behind the scenes at the IAEA General Conference, recently held in Vienna, the head of the Russian atomic corporation stated publicly that start-up of the first unit of the Kudankulam nuclear power plant was anticipated before the end of 2011 and the second unit would be commissioned in the first half of next year. This reassuring statement was based on the preliminary results of the so called “hot testing” that had just been completed on the first unit. The works were performed with the technical support of the Russian company Atomstroyexport. In accordance with the intergovernmental agreement, it was charged with carrying out phase 1 construction of Kudankulam. The responsibilities of the Russian party included drawing up a technical design and engineering documentation, supervising construction of the power plant buildings and facilities within the design scope, delivering equipment and materials from Russia and third countries, providing technical support during assembly and commissioning of the power plant, as well as training an operation and maintenance team in Russia. 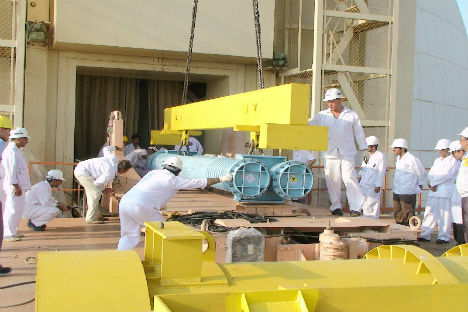 The customer, Nuclear Power Corporation of India Ltd., performs construction, assembly and adjustment works on the power plant site, including commissioning. Atomstroyexport explains, “Hot testing is the key operation at the adjustment procedure stage. It is used to test the operating capability and design specification compliance of the reactor unit equipment and safety systems, as well as auxiliary engineering systems. At the same time, the plant’s operation team learns to control the systems and equipment under normal operating conditions. After hot testing, and taking its results into consideration, the equipment of unit 1 will be put through another revision: the condition of the first and second reactor coolant loop mechanisms and systems will be assessed. After that, nuclear fuel loading will start, as will preparations for the first criticality. “In connection with the events at the Japanese Fukushima 1 power plant, the Nuclear Power Corporation of India has performed additional studies of the Kudankulam phase 1 design to check that it confirms to the safety requirements”, RG was told by a source within the Russian delegation to the IAEA conference. “Atomstroyexport made some concessions in this respect and shared exhaustive information on the safety principles for the AES 92 project (Nuclear Power Plant 92 project). It is fully compliant with the requirements of present-day regulatory documents of the Russian Federation and the IAEA and is certified as compliant with the European Utility Requirements (EUR) Club specifications for atomic power plants built after 2000. The Russian design is distinguished by an abundance of instrumentation systems in the power generating units, allowing the plant’s personnel to mount a pre-emptive response at the first sign of trouble, before abnormalities develop in equipment operation but symptoms of maladjustment might appear. Another fundamental feature of the design is the combination of active safety systems with new technical solutions based on passive protection principles. Such measures, already implemented during construction of the first two units at Kudankulam, bring them exceptionally close to fourth-generation designs in terms of aggregate severe core damage frequency. Given the lasting concern engendered by the recent events at Fukushima, these measures were among the topics discussed during the meeting between Sergey Kiriyenko, head of Rosatom, and his Indian colleagues who attended the conference in Vienna: Secretary of the Department of Atomic Energy of India Dr. Srikumar Banerjee and representatives of the customer, Nuclear Power Corporation of India Ltd. According to information available to RG, the results of stress tests performed at the Kudankulam power plant site were discussed. Meanwhile, the head of Rosatom underlined that the plant is located in a possible tsunami zone and must meet special requirements. Atomstroyexport makes assurances that the Kudankulam project goes to great lengths to take into account every peculiarity of the region. It uses tested technologies, units and systems, and employs the practices of designing, manufacturing and operating previous-generation atomic power plants with WWER reactors. Due consideration was also given to the unique features of the tropical ocean environment, with its abundance of seaweed, molluscs and fauna. Consequently, the waterworks of the Kudankulam plant perform a wide range of functions, including original fish protection systems. Yet another point must be made in conclusion. The Nuclear Power Corporation of India, in view of the hot climate and developed agriculture, has decided not to use water from local lakes but provide its own fresh water. To make this possible, the Kudankulam power plant design includes a seawater desalinisation system to meet the plant’s needs. This is just a short list of the construction solutions and technological systems already implemented at the site of the Kudankulam power plant. Dual containment and protective shieldings. System for passive heat removal from the reactor vessel. Passive system for fast high-pressure boron injection. Additional vessels ensuring prolonged passive feed of borated water into the reactor. Passive filtration system for the inter-containment area. Closed technical water intake structure – essentially a breakwater. In combination, these measures provide the constructed station with an unprecedented level of nuclear and environmental safety.